CCG's DEFINITY LCD digital film recorder is the result of more than 20 years experience in film recorder technology: When introduced to the industry in 2004, DEFINITY was hailed as the first system capable of harnessing the full potential of LCD technology to deliver a truly seamless Digital Intermediate. Since then DEFINITY has found its way into an ever growing number of post production houses, laboratories and studios worldwide. DEFINITY unites unmatched affordability with the image quality one has come to expect of considerably more expensive laser recorders: Supreme definition, color fidelity, contrast and repeatability are the hallmarks of the perfect Digital Intermediate. High speeds, ease of use, low maintenance and long life ensure profitability for years to come. Definition, Contrast, Repeatability, Color Fidelity: If one of them is lacking, you will inevitably encounter a mismatch with your Digital Intermediate. 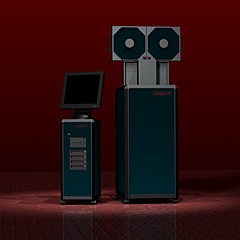 DEFINITY's photonic design and digital image preparation guarantee that color space, sharpness and density are seamlessly aligned with your DI. Life: Outlast any other film recording technology in the world. Maintenance: Crack down on wear, tear, re-calibration, downtimes. Operation: Fire & Forget - a user interface and mechanics so simple, virtually anyone can operate them.